Do you know someone who needs help with their presentation skills? 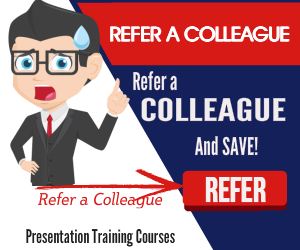 Why not refer a colleague for presentation training? You can refer them to us—and earn yourself a £20 Amazon voucher. Plus you will receive 10% off a PresentPerfectTM presentation training course or coaching session. We will offer your colleague or acquaintance an introductory discount of 10% off their first training course/ coaching session. For everyone you recommend to us, who goes on to become a customer, we will send you a £20 Amazon voucher and offer 10% off a PresentPerfectTM training course or coaching session—for your organisation. 1. You must send us a referral form or an email each time you want to refer someone to Time to Market. If you don't, we may not be able to confirm that they were referred by you. 2. We will send you a £20 Amazon voucher once a customer introduced by you has completed a training course/ coaching session and paid in full. 3. In addition to each voucher we send you, we will offer your organisation a training course or coaching session with a 10% saving. 4. You may only claim one £20 Amazon voucher for each customer that you introduce. 5. There is no limit to the number of vouchers you can claim—as long as the customers you introduce pay their invoices fully. 6. We regret that we can't award you with a £20 Amazon voucher if you introduce an existing customer.